Justin Williams has long been working to combine his interests in storytelling with activism for social justice. At the production company Kartemquin Films, for example, he coached emerging filmmakers of color through their first full-length documentaries. So when he was offered the chance to work as a facilitator for StoryCorps, the nonprofit media and cultural-heritage company dedicated to “preserving people’s stories,” Williams jumped at it. He was drawn to StoryCorps because of its simplicity (stories are recorded as 40-minute conversations between two people who know each other), its wide audience (stories are regularly broadcast via NPR), and its commitment to the representation of marginalized populations who would not otherwise have access to public media. Founded in 2003, StoryCorps has grown from operating a single StoryBooth recording studio in New York to managing outposts in Chicago, San Francisco, and Atlanta, with a mobile booth and digital app to collect stories from individuals around the country. The nonprofit was inspired in large part by the work of Studs Terkel, who documented histories of common Americans and advocated for labor unions from the 1960s through the ’90s. And yet, when a group of employees told management of their intention to unionize in late May, the organization declined to voluntarily recognize the union. In the weeks that followed, management required employees’ attendance at meetings where it discussed its opposition to the union and later disputed the workers’ bargaining unit in front of the National Labor Relations Board. The employees have continued with their unionization campaign, and will vote on whether to unionize at an upcoming NLRB election, the date of which has not yet been set. “We thought, like many progressive organizations, they would understand that the same values we communicate through our work we would ask for in-house,” said Williams. But in mandatory meetings and FAQs distributed to staff, StoryCorps has sent the message that it does not want to negotiate with a union. “They’re trying to make it seem as if the process we have chosen is not legitimate,” Williams said. Along with higher pay, StoryCorps employees are asking management for clear protocols around hiring, firing, and performance evaluations, transparent job descriptions, formal mechanisms to increase diversity and inclusion, as well as more professional development, cultural competency training, and self-care resources. 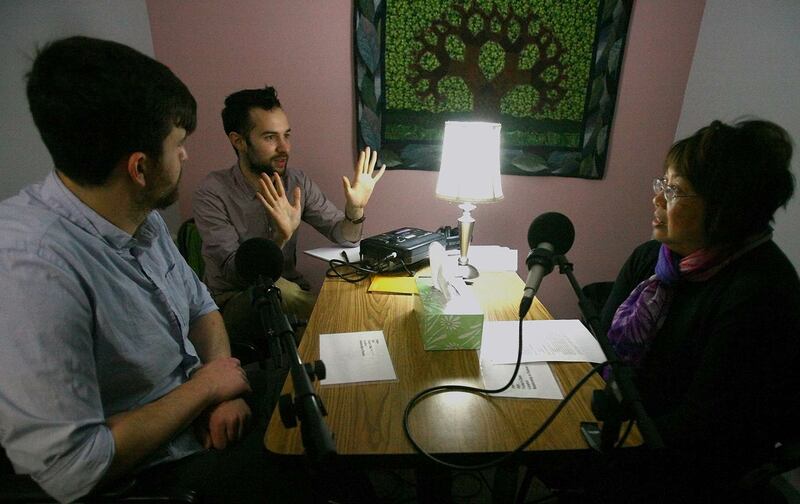 Maura Johnson, a specialist in community training based in StoryCorps’s Brooklyn office, has trained health-care workers to record the stories of patients and their families, many of which center around serious illness or death. “It’s heavy work, and the mental-health benefits at StoryCorps are not great,” said Johnson, who joined the organizing effort because she had been in a union at a past nonprofit job and had seen it work there. The StoryCorps union push brings to mind recent organizing efforts in digital newsrooms, but its struggle is more typical of a nonprofit, where workers are expected to be fulfilled by the mission of the organization without pushing for better pay or benefits or demanding labor rights. In cash-strapped organizations that see themselves as protectors of the public good, union efforts can be stigmatized, seen as an unnecessary burden on already strained resources. “The employer is really caught off-guard, because he or she thought of the organization as a team, as one in which they had a special open-communication policy,” said Jake Rosenfeld, a sociology professor who studies unions and economic inequality at Washington University in St. Louis. Rosenfeld pointed to “decades of acrimonious bargaining” between universities and graduate-student unions as evidence that nonprofits are not immune to the union-busting tactics corporations use. “One of the reasons that we didn’t unionize when I was there was almost a sense of guilt,” said Talya Cooper, a former StoryCorps archivist who now works for The Intercept. “We know it’s really hard for the organization to keep the lights on and have working Internet, so who are we to ask for a guaranteed cost of living raise every year.” According to Cooper, StoryCorps employees had been intermittently contemplating unionization since at least 2008. StoryCorps workers and CWA organizers have pointed to Democracy Now! and the Nation Institute as examples of nonprofit workforces that have unionized without great conflict. “We’ve organized a lot of nonprofits, and we’ve never seen this many obstacles,” said CWA organizer Erin Mahoney. StoryCorps’s fierce reaction to the union is symptomatic of problems that have long been simmering in the organization, according to current and former employees who described a revolving door of enthusiastic, socially conscious young people who are hired to perform demanding work for little pay and quickly burn out. Cooper said she frequently experienced poor communication between what she called “tiers of middle management” and “the people doing the work on the ground,” who were mostly low-paid facilitators, like Williams, charged with navigating the social spaces of underrepresented communities and making people feel comfortable enough to share their stories. To do this work, facilitators must be able to comfortably work across different community lines, according to Williams. After StoryCorps won the 2015 TED prize for developing a mobile recording app, Cooper recalls feeling like the organization’s attention was drawn to the “shiny new object” at the expense of the mission-driven work. The focus of the organization gradually shifted away from community engagement or “any kind of input from the people who were devoted to the communities they were working with,” according to Cooper. “The TED money really changed everything,” said Shirley Alfaro, then–regional manager of the Chicago office. “It’s easier and much cheaper to make people do it themselves when you have that digital platform, and you don’t need the human connection.” A spokesperson for StoryCorps said the organization “has not shifted away from [its] on-the-ground work” and that the app is “intended to complement, not replace,” the services offered in the recording booths. Sparkman said initiatives like Historias, which are funded by individual grants, are designed to be short-term projects, but that employees in StoryCorps booths and its mobile unit are able to continue to contribute to them. “It just means it’s not done centrally out of Brooklyn,” she said. Johnson said she doesn’t expect the CWA to be able to fix story representation with a union contract, but she believes it will be easier to advocate for change as a group. “The collective voice holds a lot more power in terms of shaping change organizationally,” she said. The employees’ concerns continued into the summer of 2016, when rumors began to circulate among the staff that a funding cut might lead to layoffs. “We didn’t know what would happen until, overnight, it did,” said Williams. “Management would say, ‘Oh, we’re just taking a pivot,’ but it was never clarified what that meant,” said Williams. Employees began meeting to discuss their grievances, and it soon became clear that an impetus to unionize had emerged. On May 26, a group of about 10 employees from various departments in StoryCorp’s Brooklyn office presented a letter to Sparkman outlining their intentions to unionize through the CWA Local 1180. A majority of non-managerial staff—the proposed bargaining unit—had signed cards with the Communications Workers of America. Isay went on to say that 70 percent of the money raised by StoryCorps pays for staff salary and benefits. “Because funding is so precarious, each year on January 1st we start with a deficit, and then work every minute of every day until literally 11:59 PM on December 31st to close the gap,” Isay wrote. In 2015, the organization reported a revenue of $9,778,792 and expenses of $9,930,780. Isay was paid $166,092 and Robin Sparkman was paid $164,804, according to StoryCorps’s 2015 IRS disclosures. Once management knew about the efforts to unionize, StoryCorps also began holding captive-audience meetings that employees felt required to attend and during which they were not allowed to ask questions of management, according to Williams, Srikishan, and Johnson. (A StoryCorps spokesperson said employees were not required to attend the meetings.) Sparkman said the meetings were informational and included an open floor for questions. Though she admitted to using the words “captive audience” while speaking with staff, Sparkman said she misused it. “I was unfamiliar with the term and I apologize,” she said. StoryCorps also contested the employees’ proposed bargaining unit before the NLRB. The union has proposed a unit of 30 non-managerial employees; the company is pressing for a unit of 14, arguing that many employees are in temporary or grant-funded positions and therefore ineligible for union representation. The NLRB hearing, which lasted three days in mid-June, overlapped with an all-staff retreat in New York City. Williams was subpoenaed to testify about his work at the company. In a 2016 interview with Democracy Now!’s Amy Goodman, Dave Isay said of his book Callings: The Purpose and Passion of Work, “…there are so many messages in the ether now that work is about…doing as little as you can to get as rich as you can, as quickly as you can. And this book shows a different path, a path to people who’ve got this real sense of joy and love in their work, and want to get up in the morning and go in and do something.” Read in the light of Isay’s resistance to the StoryCorps union, his comments seem to imply that a request for higher wages would sully the joy and the love his employees should have for their work. At StoryCorps, management and employees are not on the same playing field, according to Alfaro, who said she was “pushed over the edge” when her job expectations were abruptly changed—to include more fund-raising work—without any explanation or increase in salary. A spokesperson for StoryCorps said the organization does not comment on individual employees or personnel actions. Alfaro left StoryCorps in May and now works at the National Public Housing Museum.